Dreamspace Fragments is an exploration into generating representations of the narrative content of dreams as virtual environments‚ or “dreamspaces.” Using a derivative of the classification system for dream content analyses developed by Calvin Hall I encoded the narrative content of each of 12 dreams recorded from 1989 to 2000 into numeric values which were then used to define the parameters for generating 3-dimensional objects that are rendered as VRML worlds. The title refers to these as both dream spaces and fragments as I consider each dream to be a part of the continuum of my dreaming life. Eventually‚ the aim is to construct an online virtual environment where myself and others can share dreams in this way. Contributing a dream narrative online would result in its translation into a 3-dimensional online space. This virtual world would be a landscape of collective dreamspace. 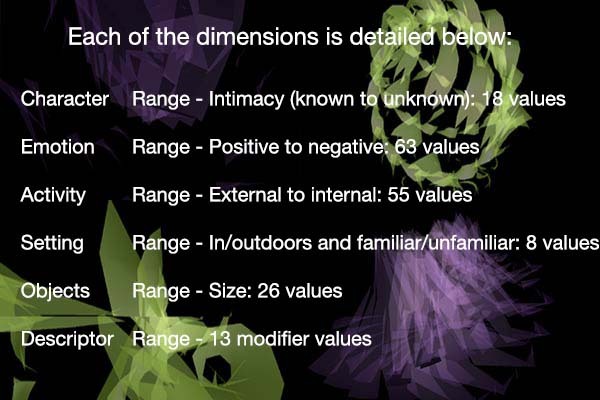 Values calculated for narrative elements for each dimension used to create the RGB color values‚ the number‚ shape‚ placement‚ and orientation in space of the 3-dimensional elements in the vrml space.